Board of Education Shield (for Arduino) Product Guide. 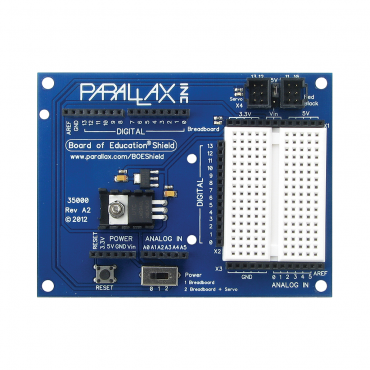 Board of Education Shield for Arduino web tutorials (Parallax Learn). 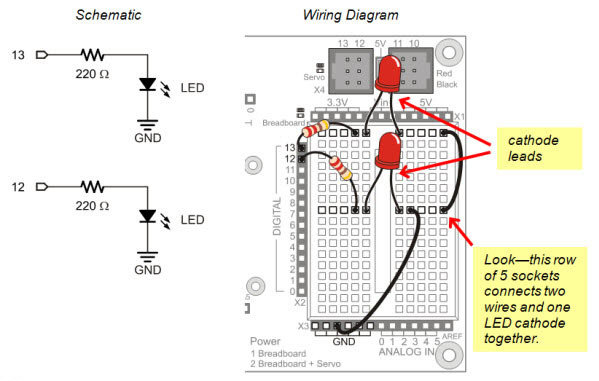 Microcontroller Kickstarts web tutorials (Parallax Learn). IR Remote Controlled Shield Bot project (Parallax Learn). Shield-Bot Roaming with Ping))) project (Parallax Learn). Plug the Board of Education Shield into your own Arduino for convenient breadboard prototyping and servo ports, with no soldering required. Arduino programmers who appreciate Parallax's breadboard-friendly sensors and accessories will find them even easier to use with this shield. 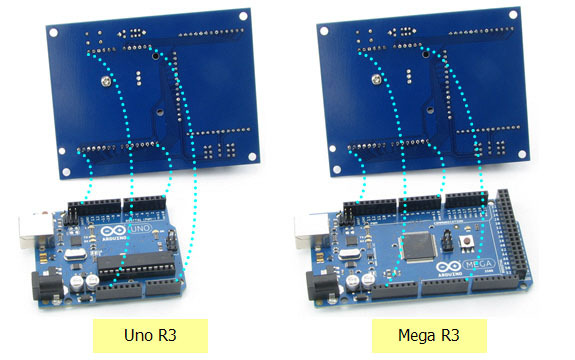 Tested with the Ardunio Uno, Mega, and Duemilanove, the Board of Education Shield is designed to be physically compatible with any Ardunio Uno or Mega form-factor module. Use it with the Propeller ASC from MGH Designs for an inexpensive multicore development platform. The Board of Education Shield is available alone, or conveniently packaged with the classic Boe-Bot chassis, servos, electronic components, and additional hardware in the Robotics Shield Kit. 17 row x 2 column breadboard for convenient circuit-building. Headers for power (Vin, 5 V, 3.3 V) Ground, Digital I/O and Analog In are brought adjacent to the breadboard. Onboard 5 V regulator supplies up to 1 A, great for robotics and animatronics applications. Onboard 3.3 V regulator supplies up to 200 mA for project circuits and accessories, such as XBee modules. 4 servo ports with power selection jumper for regulated 5 V or Vin (Arduino's supply voltage). 3-position power switch for power header only or power header + servo. ports. Board reset button resets the Arduino. Supply indicator LEDs for breadboard and servo power. Power requirements: 7 to 12 VDC, through Arduino VIN. Communication: Serial over USB through Arduino. Dimensions: 4 x 3.05 in (10.2 x 7.75 cm). NOTES: The programming lanugage "RobotC" (RobotC.net) works with the​ Robotics Shield Kit. Arduino or similar form-factor module and programming cable required, not included. Optional hardware for standoffs and for securing the two boards together is available separately; see the Board of Education Shield documentation for details.